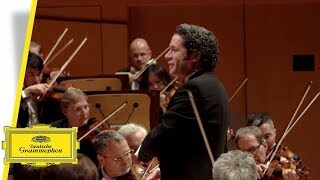 Tying in with Disney's "The Nutcracker and the Four Realms" for which he conducted the Original Soundtrack (music composed by James Newton Howard and to be released on October 26), Gustavo Dudamel and the LA Philharmonic release Tchaikovsky’s full original Nutcracker ballet on November 30 on Deutsche Grammophon. This recording marks the starting point of DG’s new partnership with the LA Philharmonic and Gustavo Dudamel, who celebrates his 10-year anniversary with the orchestra this year. Under Gustavo Dudamel’s direction, the LA Phil has become one of the leading orchestras in the world, admired for its unmatched commitment to new music, diversity and inclusion. Celebrating their 10-year partnership, Deutsche Grammophon is releasing their 2013 live recording of Tchaikovsky's The Nutcracker.